Researchers at the US Department of Energy’s Oak Ridge National Laboratory broke the exascale barrier, achieving a peak throughput of 1.88 exaops—faster than any previously reported science application—while analyzing genomic data on the recently launched Summit supercomputer. The ORNL team achieved the feat, the equivalent to carrying out nearly 2 billion billion calculations per second, by using a mixture of numerical precisions. Traditionally, scientific computing has relied on double-precision floating point operations, however, interest in reduced numerical precision has grown in recent years due to breakthroughs in artificial intelligence and machine learning. In this case, researchers were able to implement high-speed single- and half-precision operations to gain additional performance. The record-setting run was carried out using a representative dataset on 4,000 of Summit’s GPU-accelerated nodes. 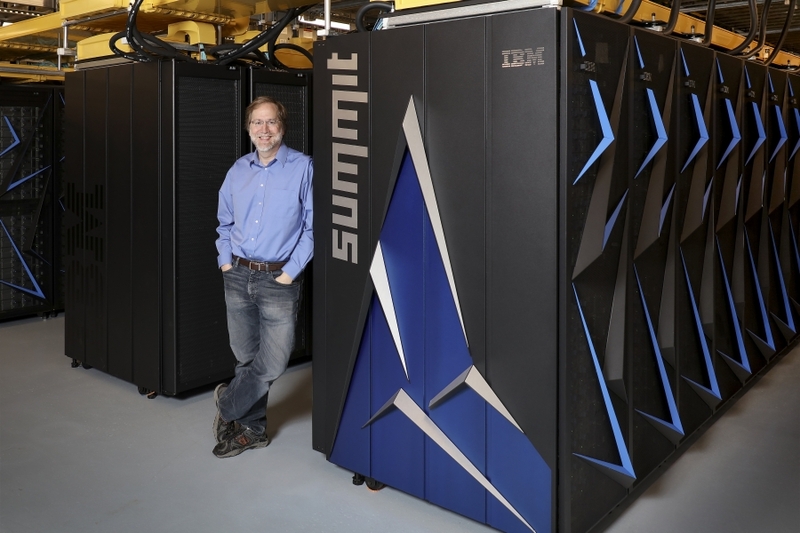 The IBM AC922 system is the new leadership-class supercomputer of the Oak Ridge Leadership Computing Facility, a DOE Office of Science User Facility located at ORNL. Funding for biological research and early application development related to this project was provided by the DOE Office of Science’s Biological and Environmental Research program. To attain the performance mark, the team mapped an algorithm packaged in the comparative genomics application Combinatorial Metrics (CoMet) to Summit’s state-of-the-art architecture. Specifically, ORNL researchers modified CoMet to exploit the exceptional Tensor Core matrix multiplication capabilities built into each of the system’s 27,648 NVIDIA Volta GPUs. On Summit, the team achieved more than a 25-fold code speedup compared to runs conducted on the OLCF’s previous leadership-class supercomputer Titan. Leveraging the Tensor cores alone enabled a 4.5-fold application speedup, said ORNL computational scientist Wayne Joubert, the code’s lead developer. The CoMet algorithm deployed in this demonstration, called the Custom Correlation Coefficient method, specializes in comparing variations of the same genes—or alleles—present in a given population. Exascale-level performance allows researchers to analyze datasets composed of millions of genomes—a size that was previously impossible—and study variations between all possible combinations of two or three alleles at a time. Scientists can use this information to uncover hidden networks of genes in plants and animals that contribute to observable traits, such as biomarkers for drought-resistance in plants or disease in humans. Growth in the amount of genetic data available to researchers and advances in computing are already bringing some of these networks to light. A research team led by ORNL computational biologist Dan Jacobson capitalized on these trends to discover key regulatory genes of plant cell walls that can be manipulated to enhance biofuels and bioproducts. The team’s findings were published in Frontiers in Energy Research in May 2018. A strategic partnership project between ORNL and the US Department of Veterans Affairs is combining clinical and genomic data with machine learning and Summit’s advanced architecture to better understand the genetic factors that contribute to conditions such as cardiovascular disease, prostate cancer, suicide prevention, Alzheimer’s disease and opioids addiction among others.